I have 192.168.254.0/24 at Site A, and 192.168.253.0/24 at Site B. Site A pfSense has 3 interfaces. 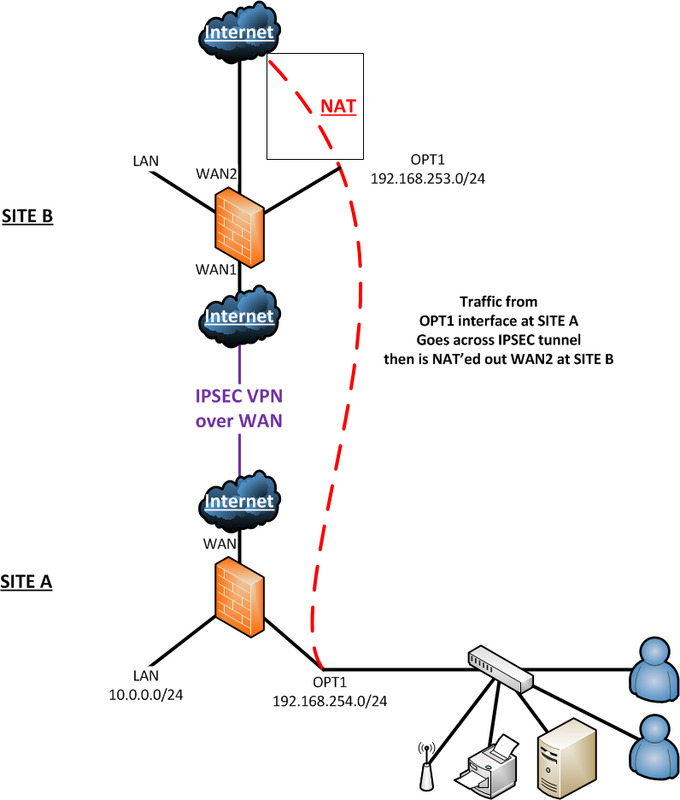 I am wanting all traffic that goes into OPT1 at Site A to be directed through the IPSEC tunnel to OPT1 at Site B. Site B contains NAT rules to allow 192.168.253.0/24 to access the internet. What sort of settings do I need on the tunnel @ Site A pfSense to make this happen? PS, I've found a guide on how to send ALL traffic through the IPSEC tunnel but this is not what I want – I just want traffic out of OPT1 to go through the IPSEC tunnel. Note that the phase 2 entry at Site A only applies to local traffic from LAN net. Out of curiosity, have you tried setting up an additional phase 2 entry on the tunnel config at Site A to Site B for Source=OPT1 Net, Dest=Net 0.0.0.0/0? In theory this would tell all the traffic at Site A that is not local to route through the tunnel. On the other end, you likely don't even need a complementary Phase 2 entry. If you do this, keep in mind that you may need a firewall rule for IPSec traffic at Site B to allow this traffic in order for it to work.